Vehicle Donations to FUF helps individuals and neighborhood groups plant and care for street trees and sidewalk gardens in San Francisco. This “green infrastructure” improves the city by beautifying neighborhoods, cleaning the air, raising property values and reducing polluted stormwater runoff. 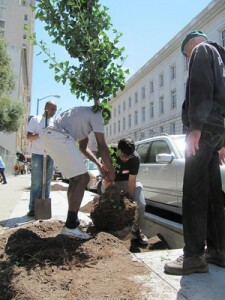 There are few ways to make a more tangible, long-lasting, positive impact on your community than to plant trees. Trees are an investment in the future -- in a greener, better tomorrow. Your donation plants those trees.